At just 16, Adelaide’s Benjamin Maio Mackay has worked with best-selling author Matthew Reilly to bring an audio-drama adaptation of his book Ice Station to the Fringe. One of the actors involved, Sebastian Cooper, explains what’s in store. A cover image from the novel Ice Station. When two divers vanish without a trace while exploring 3000 feet beneath an ice shelf on the fictional Antarctic research station Wilkes, an SOS is sounded out. A group of United States Marines led by the enigmatic but virtuous “Scarecrow” rushes to their aid ­– but it turns out the marines weren’t the only ones to receive the distress call. Thus begins the battle for survival in Australian author Matthew Reilly’s thriller novel Ice Station, which has been adapted for the Fringe show Matthew Reilly’s Ice Station Live in a way that can best be described as “cinema for the ears”. The adaptation is the brainchild of young Adelaide actor, writer and director Benjamin Maio Mackay, who first met Reilly when interviewing him for his podcast, Benjamin Maio Mackay’s Talk 2 Me. During the interview, Reilly explained his dream of bringing his novels to life through other media. When Maio Mackay suggested the idea of an audio-drama, the author was intrigued. 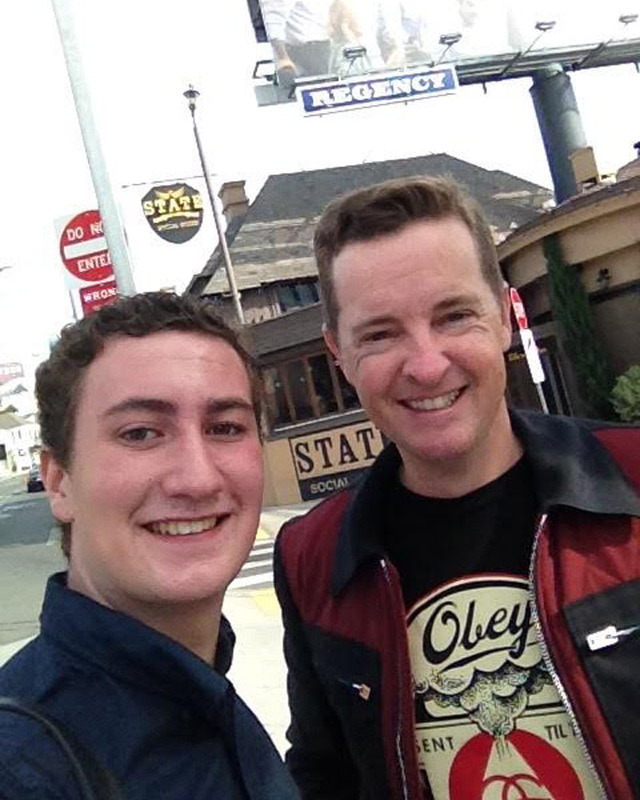 Benjamin Maio Mackay with Matthew Reilly. Reilly gave the go-ahead for the project, suggesting it be trialled at the Adelaide Fringe. From that point on, the pair kept in close contact, with Reilly offering advice and support where possible. Set against an entirely black theatre, Matthew Reilly’s Ice Station Live sees 12 South Australian actors portray a variety of characters in a live reading of the first three parts of the audio drama. Accompanying the actors is a soundtrack of 946 sound effects which surround the audience and encapsulate them within Ice Station Wilkes. The task of creating a Fringe show, especially one as unique as Ice Station, “was certainly a challenge”, Maio Mackay says. Maio Mackay was especially keen to maintain “the witty dialogue, the huge action sequences and the intrigue surrounding the lead character, Scarecrow”. Maio Mackay overcame this issue by developing new scenes that also built up some of the lesser characters from the novel. At 16 years old and having finished high school only last year, Maio Mackay acts, directs, writes, produces and creates sound design. He also keeps 11 other actors – some of whom are twice his age – in line. “I love working in the Adelaide Fringe,” he says. Featuring Josh Mensch as Shane “Scarecrow” Schofield and Mary Rose Angley as Elizabeth “Fox” Gant, Matthew Reilly’s Ice Station Live has a two-week season, running from February 16 to 28 at The Opera Studio in Netley.